The Mobile Robotic Training Lab is an instructional tool used by the RTP and its partners to create an awareness and interest within the community and industrial groups for the development of a skilled industrial robotic workforce, and individuals seeking a rewarding lifelong career path in a modern industrial setting. The Mobile Robotic Training Lab is used to generate student interest, excitement, and motivation about robotics. It is also an excellent opportunity for educators, counselors and administrators to learn about the robotics industry and the jobs that are being created for the workers of tomorrow. Parents also have an opportunity to tour the lab and get a up close look at the career opportunities of the future. The Mobile Robotic Training Lab is able to offer one-day or one-week camps to gain the interest of the robotics industry to students, teachers, counselors, and parents while allowing them a hands-on experience with the equipment. Safety Awareness, while working with robotic equipment, is also covered during the session. 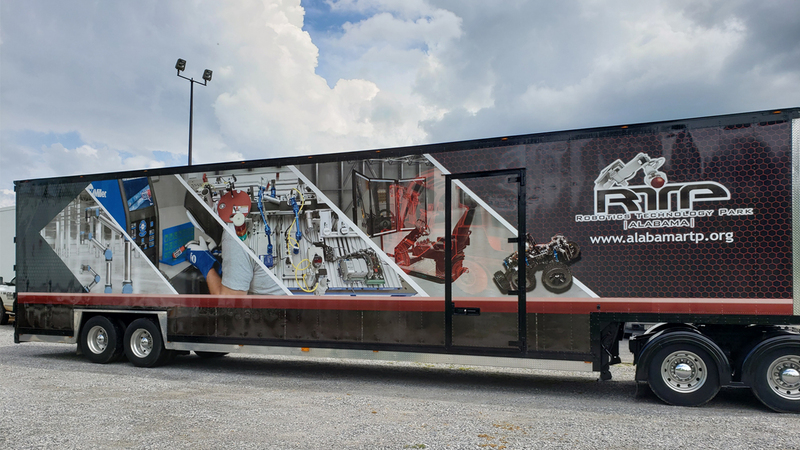 For schools or institutions that are interested in the RTP Mobile Lab coming to your facility, please complete the RTP Mobile Lab Request Form and someone will contact you to schedule. For more information, please contact Mike Evans at 256-278-1990 or by email:mevans@aidt.edu.